i've been eyeing the tees at j.crew for weeks now, trying to decide if i can spend $50 on a grey t-shirt. in addition to that, i have the "i could make that" problem; i see something i really like, but seems too expensive & shrug it off saying that if i wanted it i could fashion it for myself. this time, i decided to make it happen. the result is a cozy tee with a little bit of sparkle, perfect for a casual, put together day. i thought for a while on color scheme & thought that i would get most wear out of something that was a monotone pallette. i considered doing something pink/beige with gold sequins & beading, but ended up using a heather grey tee with grey tule, silver sequins & both silver & white beads. the j.crew tees run between $40 & $50, this project will cost you around $15-20. i chose a tissue tee from h&m, costing around $7.50; my other supplies ran about $8. after a couple of trials with shape of the design & beading patterns, i have for you a finished product & tutorial to boot. try to come up through the tule where you want the outside of your sequin to lay, going back down through the center allows you to secure it's placement. this embellishment is made up of 7 patches of sequin/beading. i've provided a pattern for the tule to be cut, but feel free to modify it to your liking. add bigger patches, more patches, less patches, etc. each one that i've shown here is open for change. i'm curious about the care of this shirt. i'll let you know what i find out, but for now i may handwash or machine on delicate. i'd definitley recommend line drying. pre wash your tee to make sure that it doesn't shrink much after the project is finished. unstring 1 yard of your sequins (unstring the rest as needed). print attached pattern and cut tule according to the instructions. layer both a pieces underneath the 3 b pieces. double thread your needle, tying a knot at the end. coming up from the bottom of your tule at the edge of the b pile, pull the needle taught. thread one sequin, come back down through the center of the sequin, then the tule. continue step 6-7 for each sequin, forming a series of circles within each other. finish the sequins off by cutting the thread at the needle & tying the two pieces in multiple knots. 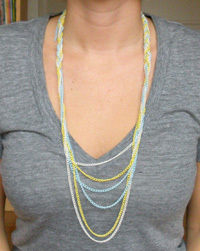 now you'll want to add the beads to the center of each sequin. with a double threaded needle, come up through the center of one sequin. thread the bead, coming back down again through the center of sequin. this adds a nice texture & secures the placement of the sequin. continue steps 9-10 for each sequin. finish the beads off by looping the remaining thread through sequin stitching, then cutting the thread at the needle & tying the two pieces in multiple knots. next, you'll want to fill the empty space with filler beads. i followed this tutorial to add some extra beading between sequins or outline other patches. continue with steps 4-12 until you've added each patch to the entire embellishment. notice that the smaller sequin clusters do not have any tule layers beneath them. here you will simply attach directly to the two a pieces of tule. once you finish the entire embellishment, it's time for the fun part. go ahead & put on the tee. you'll want to line up the full piece to make sure you like the placement. attach the embellishment to the tee with straight pins. hand stitch the embellishment, coming up from underneath & trying to stay underneath each sequin patch (but above the tule). this provides a strong attachment without visible thread. click here for a picture led tutorial & full size pattern. this project ended up taking a couple of 2 hour sessions, the beginning was especially slow. hopefully this pattern & tutorial will make things a little quicker for you. i'm really happy with how it turned out & am tempted to make a couple more in different colors. please feel free to email me or leave comments with any questions or suggestions you might have on this tutorial, i always love to hear from you. holy crap woman! good job!! i don't know if i'd have the patience for this, but i might just have to try!! those $50 tees at j.crew are killin' me. This top looks amazing! You did a great job. I actually like yours better so great job! thanks for sharing this...im going to try it out! too brilliant - I am going to try this next week. I love the t shirts but stayed away from the $ 50 dollar price point. Thank you. Sweet tutorial. Is this the urban crafters version of bedazzling? It looks great! I definitely prefer yours--thanks for the tutorial. So cute! and apparently not that difficult! Thanks for posting this! I love you hair too! Oh cool, I also have that problem of deciding to buy something or just taking the time to make it myself. Super-cute haircut by the way! your shirt is adorable! Thanks for the great idea! A-mazing! I can't wait to try it out! So pretty, and the tulle trick is brilliant!! :) Found you via whipup. Love it! I've been coveting the J. Crew tees and just might have to give this a go! That is so great...can't wait to try it. Thanks for posting a tutorial! One of these days I'm going to buy my neighborhood thrift store out of tees, throw myself a little tee-modding par-tay, and have the coolest t-shirts in town. Thanks for your contribution to my dream. This is great! Super! I shared in my blog, ok?